Graphic designing is one of the most interesting areas. This is why Apple made sure that all the users gain access to the most amazing graphic design apps. These apps make the lives of users so much better because they can design whatever they want and they can use their designs the way they want to. This is a true social network for all users of IOS who can use this app to take the best photos and to edit them the way they want to. Users love that this app gets all the users together where everyone is so kind and supportive and will offer help or insight when possible. Users love that this app has evolved over the years. From offering filters or being an actual shop now the camera even has a sound when it is used. It was last updated on the 6th of April 2017. 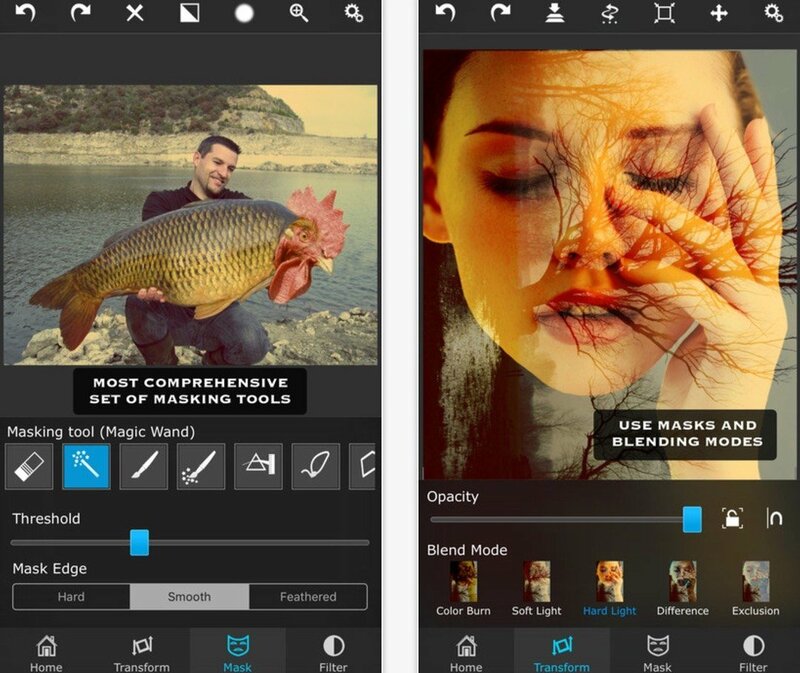 This is probably one of the best graphic design apps but it is not a free one. Users have to pay $3.99 in order to download and use this app. It was last updated on the 9th of December, 2016 and can be used on iPhones and iPads. This app is specially designed to improve the look of your portraits. One touch will allow you to make your portraits as professional as possible. The automatic depth of field will draw the focus on the people in the picture and blurs the background in a way that would the portraits look so artistic and unique. The bokeh feature will allow you to transform the background into any blurred form of your choice. Users just love how this app makes aniPhonee so much better than a DSLR camera. You don’t need to spend a lot of effort, time or money to buy apps that will allow you to blend, mix, copy and paste pictures on top of each other. For only $1.99 you can download this app and create professional grade superimposed photos. You can simply choose the background photo and the foreground photo and use a lot of masking tools to cover the areas that you want to conceal. You can adjust the colors, the zoom and the exposure for high quality photos that are so easy to achieve. The last update was on the 16th of March, 2017. This free app allows you to send your photos to real professionals who are ready to retouch and edit your photo the way you like it to give you the best quality possible. With the express features, the designers will adjust the exposure and delete noise from the picture to enhance it in the best way possible. In the custom service you can type your requests in the note section. You ask our designers to remove or add any feature as they are very experienced with Photoshop. This is definitely one of the best graphic design apps because it combines the best features and the best talent. It was last updated on the 25th of September, 2016. This is a cutting edge app for video and photos artistry that is made available for IOS users for only $0.99. It is an award winning app and was featured on many social media platforms and magazines. It was even chosen as the best app of the year by Apple. No signup is required and you will immediately gain access to the most comprehensive editing tools library that will allow you to edit and adjust your images the way you want to. In addition to having real time filters that help you to take the photos that you dream of. The last update was on the 22nd of March, 2017. If you like to add your own custom texts or quotes to your pictures then this app is for you. This app was last updated on the 13th of January, 2017 and is offered for $4.99. With this app you gain access to the best text designer. It is like having a graphic designer with you will adjust your texts and give them a professional look to be posted on your blog or your social media accounts. For only $3.99, IOS users can use this app to edit their videos and pictures in no time. It has been selected as the best paid app in 12 countries due to the amazing features that users get. The customizable filters will make your pictures and videos pop and you can edit everything with a few clicks. These amazing graphic design apps make the IOS experience so much better for different users. They can help you to edit and adjust any of your creations in any way you like.